Data irreproducibility generate a lot of discussion in science these days, some of which arises from a type of bias. Irreproducibility is often caused by problems such as poor experimental design and execution, as well as weak statistical analysis. Bias allows scientists to fail to look at (or subconsciously downgrade) all of the available data, including information that could disprove their hypothesis. A classic example is the discarding of select data points because they are “outliers” (i.e. markedly different from the other pieces of data). Some type of rationale that supports the exclusion decision is generated, even if that rationale is neither written down nor verbally conveyed. Scientists with good training are taught to envision and then conduct experiments that might disprove their hypothesis. Failure to disprove the hypothesis is supportive of their theory, but it cannot prove it. Many scientists fail to be as rigorous as they should be in their work. This usually stems from intellectual laziness, hope of financial rewards, poor training, bias, hubris, and/or dreams of scientific glory. Eradicating these problems is extremely difficult, and many don’t even recognize them when they crop up. As much as some people don’t like to admit it, there are many examples where bias in politics affects science. When politicians refused for 22 years to allow the Centers for Disease Control to study gun violence (because of the Dickey amendment), this was a clear example of bias working against science. Politics has begun to work its way into the FDA’s drug approval process, as evidenced by the agency’s endorsement of Sarepta Therapeutics drug Exondys 51 (eteplirsen) for treating Duchenne muscular dystrophy. This approval was given despite a lack of compelling data and over the objections of in-house scientists who reviewed the application carefully. Politics allow for the existence of hundreds of dubious stem cell clinics in the U.S. These modern day purveyors of high-tech snake oil have operated for years with impunity, peddling bogus treatments for a wide variety of disorders for which they’ve never been tested. Reports have recently appeared indicating that patients in unregistered “clinical trials” have gone blind following injection of fat-derived stem cells into their eyes. Finally, medical clinics around the world offer untested treatments to terminally ill patients with the real intent to merely separate the sick and desperate from their money, while governments look the other way. We know that human beings are, by our very nature, fundamentally flawed. Some of our leaders have many admirable qualities, along with a smattering of those we might loath. We readily accept this, even though we wish our friends, lovers, relatives, heroes, political representatives (and even ourselves) weren’t so darn imperfect. In science, failure to examine and integrate all of the relevant data leads to flawed hypotheses that eventually fall apart when others point out their inconsistencies. Failure to “look at all of the data” is actually quite common in politics as well, especially with candidates that are supported because of their views on a single issue (for example, abortion). Constituents will vote for such a candidate if they agree with him or her on this one core issue. They turn a blind eye to all of the other positions of their favored candidate, even though they might be illogical, contradictory, and even (at times) reprehensible. In science, facts and expertise have traditionally been, and continue to be, highly valued commodities. In politics, these elements are not so treasured, especially now in the “post-truth” era of “fake news”, “alternative facts”, and other drivel that bears a closer resemblance to propaganda than reality. Science, however, is about identifying actual facts, uncovering the hidden details that explain how things operate in our universe. Having said that, moral and ethical considerations must enter into the scientific process when required. Too often these considerations have been ignored, with bias born of racism and a wanton disregard for the rights of the poor and underprivileged. This has led to the marginalization of these communities and their exploitation. The infamous Tuskegee studies of end-stage syphilis in black men conducted by the U.S. Public Health Service were done to understand the natural course of the disease. This ultimately involved denying the men treatment with antibiotics that would have cured them. In a similar vein, dermatologists treated inmates at Holmesburg Prison in Philadelphia for nearly 25 years with a variety of dangerous agents (in non-therapeutic “studies”) simply because the incarcerated men were a ready source of “acres of skin.” Another well-known case was the deliberate infection of mentally disabled children at the Willowbrook State School in NY with live hepatitis virus, and then watching as they became sick. Ethics must always play a part in our thinking as we search for biological truths. Fudging data or promoting drugs for non-approved indications simply to make a buck only serves to impugn the reputations of the best and brightest scientists among us. People these days are demanding evidence-based medicine, not that which arises from conjecture and supposition. Clinical trials, unfortunately, are also subject to the same bias issues that bedevil basic science. This helps explain why we so often see post hoc analyses of failed trials that yield a “promising-looking” subgroup in which a drug or treatment seems to have performed well. These hints of success are merely a scientific mirage, conjured up by minds that want to believe so badly that the drug or treatment really worked. These folks will then devise a rationale for a new trial based on their biased interpretation of the subgroup analysis. When that “wish” is tested in a subsequent trial, the apparently positive outcome usually disappears, and the hypothesis once again crashes and burns (usually in an expensive way). The putative effect was indeed illusory. Bias in the selection and interpretation of elements of the data led to a second round of clinical failure. This bias may actually be conscious. Sometimes clinical trials are done not because the data are so compelling, but because investors in a company have bet on a particular outcome, and those running the trial believe that they have no choice but to move forward with less-than-stellar data. Companies that act this way often have no other drugs in their pipelines, thereby adding an element of desperation to the proceedings. 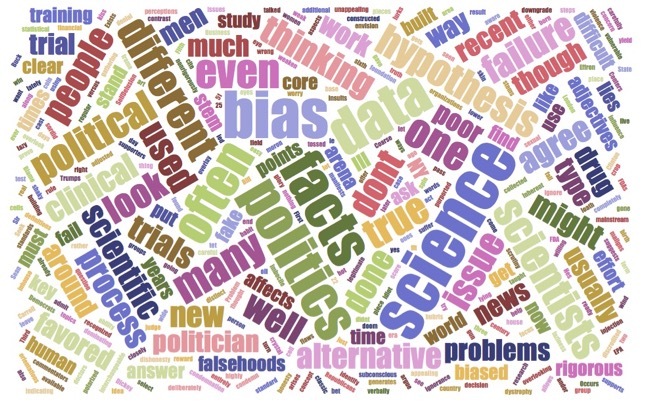 A key difference between science and politics: in politics, judgments are shaped by people’s needs, wants, and desires, whereas in science, decisions should be driven by facts i.e. solid data. Facts, of course, used to be something that everyone believed in. Nowadays, they are often used as political footballs where certitude is a distant virtue and “alternative facts” (previously known as falsehoods or lies) are paraded about in an effort to confuse the public. “Critical examination” has become an abandoned art in many quarters, rejected as “elitist” by folks who peddle nonsensical conspiracy theories that common sense should readily reject. We accept that science and politics are inherently distinct enterprises that operate quite differently. However, a failure to recognize the true value of facts as well as the pernicious effects of bias will doom both science and politics to abandonment at a time when the proper use of both of these processes is more important than ever. Those looking to get a better understanding of eugenics should read Adam Cohen’s excellent historical treatise on the subject Imbeciles: The Supreme Court, American Eugenics, and the Sterilization of Carrie Buck. A historical account of the Tuskegee experiments on black men in the South is told with clarity in James Jones’ Bad Blood: The Tuskegee Syphilis Experiment.